Have you ever been in the position where you want to go somewhere new but you don’t know where to go to? You don’t want to go to the place you've known before but… you also have a limited budget to go there. So, what do you do? I remember the first time I bought my iPhone in 2012, the first thing I did after setting everything up was to look for apps to download. Because I love traveling, of course I looked for travel apps. And my eyes caught one interesting app named “Skyscanner”. Didn’t know what that app do, I downloaded it first. I tried the app and later got so excited because it turned out that Skyscanner is soooooo useful. So, what does Skyscanner do? Simple. It stands for it name. It scans the sky. To make it more literal and easy for you to understand, Skyscanner for me is an aggregator site. It pulls out pricing data from airlines’ websites (it scans the sky, right?) and sorts them out to give us the best airline combination to get the best ticket price. With Skyscanner, you don’t have to go to each airline website to search for the cheapest airline ticket. But that’s not all what Skyscanner can do! Still remember my first question? Skyscanner can help you solve the problem. How? Via it’s “Explore” facility – which I love the most, by the way. All you have to do is set your departure airport, select “Everywhere” on your destination, and then pick your departure and return date, then click “Explore”. Voila, you can see the world revolves. Skyscanner scans the world for you and show you the places that you can go AND the ticket price to go to each place. There, you can find your new and unknown place to go, and at the same time you can also choose which place that suits your budget. Very useful, isn’t it? Another thing that I love the most about Skyscanner is – I call it – the “Comparison Graph”. What is that, you may ask? Well, who doesn’t want the cheapest airline ticket price? But the problem is… you don’t know which month (and dates) can give you the cheapest price, right? Again, Skyscanner can help you with that! You can just choose your departure and destination, pick the date range (you can range it from January to December), click “Search”, then click the graph button. Skyscanner will then show you the lowest price available for each date and also the lowest benchmark. From there, you can pick your desired dates and prices. What makes me love Skyscanner the most eventhough now there’s so many airline tickets site aggregator is.. Only Skyscanner understands travelers and their needs. They know the exact problem and offer the solution to that problem. Skyscanner knows that travelers want to just spin the globe and pick one place wherever the fingers are pointing. But hey, who has a physical globe nowadays? Skyscanner provided us with virtual globe and the “Explore” facility. Skyscanner also knows that one of the major traveling problems is to find the cheapest ticket price. But no one knows the formula on finding the cheapest ticket price dates. So Skyscanner came up with the “Comparison Graph” solution. 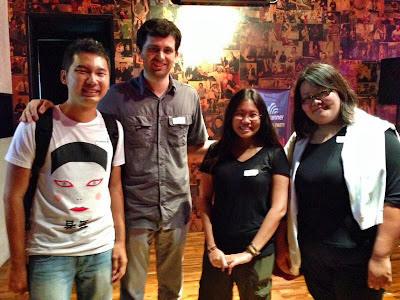 Now, with that big of a love with Skyscanner, can you imagine how happy I was when a friend invited me to come to Skyscanner Bloggers Party in Jakarta? I was ultra-happy! I get to meet with the guys behind this thoughtful app! With the help of @TravellersID and @TravellerKaskus, Skyscanner’s Singapore regional office held Skyscanner Bloggers Party at Pong Me Gunawarman last Thursday, Oct 24th successfully. They invited the legendary nomad @DuaRansel and also travel documentary filmmaker Dodid Wijanarko to share their views and stories about how their love of traveling made them a world nomad and a filmmaker. 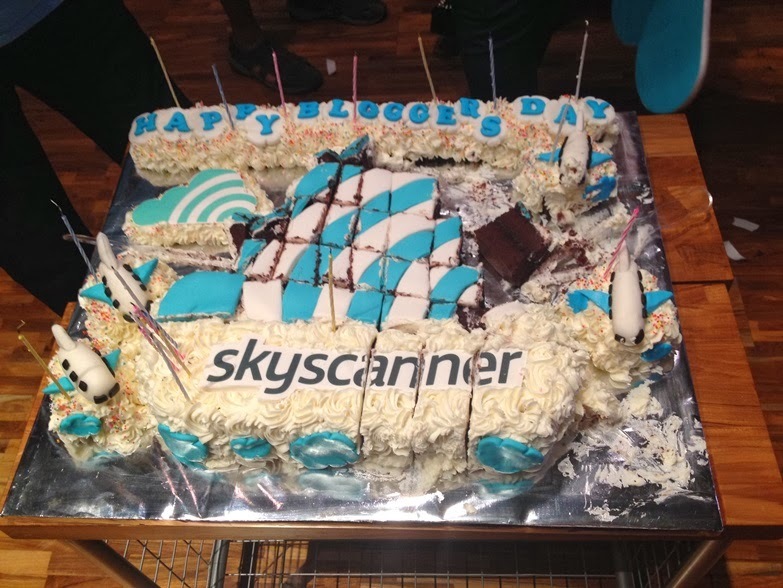 They also prepared a cute cake with planes above the cake to celebrate National Bloggers Day on the 28th, so cute!